How can the loan payment calculator be useful to you? 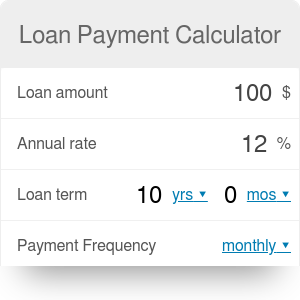 Loan payment calculator is a handy tool to compute the required monthly (or any other frequency) payments after taking a loan requiring equal payments. For example, you can estimate your car payment or mortgage installments. We also introduce the loan payment formula and present a practical guide that helps you to understand how to calculate monthly payment on a loan. Besides, you can read about what is a loan payment schedule so you can see in details how loan payments are constructed. When you are planning a purchase, but you realize that you cannot afford it from your savings or income (alternatively you are about to take an investment decision requiring financial support), the most straightforward way to obtain the necessary money is to turn to a bank for a loan. If you are in such a situation, probably one of the first things that comes to your mind is whether you will be able to make the required payments (or in other word, installments) from your income. To solve this puzzle, you need to answer the crucial question: what will my loan payment be? With our loan payment calculator, you can quickly compute the amount of money you need to devote for loan repayment over a payment period. This device will also give you the total amount you need to pay back during the whole loan term. Alternatively, you can use it to compute the loan amount from the loan payments. Before we go any further, it is essential to discuss a few specific terms you may encounter when you are considering taking a loan. In the following, you can get familiar with these phrases so you will have more of an understanding of the concept of loan. Loan amount: this is the amount of money (also known as the principal) that a bank (or any other financial institution) lends, or conversely that an individual borrows. In other words, this is the amount that the borrower agrees to pay the lender when the loan becomes due, not including interest. Annual rate: this is the interest rate (also called nominal rate or quoted rate) that is quoted by banks (or other parties). It is also important to take into account the expected inflation rate when you inspect a quoted rate: the higher the inflation rate, the lower the real interest rate; thus the real burden generated by the interest rate lessens. Payment term: in our context, it refers to the time frame the loan will last if you only make the required minimum payments in each month. For example, a 20-year fixed rate mortgage has a term of 20 years. Auto loans often have 5 or 6-year terms. Payment period: it refers to the specific period over which the borrower is obliged to make the loan payments. Periodic rate: this is the interest rate charged by a lender or paid by a borrower in each payment period. It can be annual (in this case it equals the annual rate), semiannual, per quarter, per month, per day, or per any other time interval. For example, a bank might charge 2% per month on its credit card loans, or it might charge 1% quarterly on loan. To get the periodic interest rate you need to divide the annual rate by the number of payments in a year. For example in case of monthly payment with a 6% annual rate the periodic interest rate equal to 6% / 12 = 0.5%. Loan payment: this is the amount of money which is required to be repaid by the borrower for every payment period. In most of the cases the borrowed money is refunded in loan payments (installments) in equal amounts through the payment term. This kind of loan construction is called an amortized loan. Loan payment schedule/Amortization schedule: each loan payment consists of two parts: part interest and part of the repayment of the principal. The share of interest is higher at the beginning of loan term, but it declines as the loan balance decreases, in other words, the more loan has been paid back, the higher the share of the principal in an installment. After taking a quick journey though financial terminology, we can construct the loan payment formula applied in our loan calculator. It is important to note that the loan payment formula above is based on amortized loan construction with equal payments where the interest amounts are computed after the unpaid principal. The other type of loan construction based on compound interest where the interest amounts are added to the principal balance after every specific period corresponding to the compound frequency. If you would like to dig a bit deeper in the logic behind the presented formula, you may check the related present value and future value calculators as well. Using the above values, we can employ the previously stated loan payment formula. After computing the periodic loan payment, you can have a much better view on your future obligations that help you to decide whether you can handle the repayment of the loan. Additionally, you can use our loan calculator to compute the loan amount or total loan payment from the periodic installments. Let's presume that your monthly loan payment is 100 dollars with a 9 per cent annual rate with two years payment term. As we discussed before, most loans are repaid in equal payments (installments) over a specific time: loans constructed like this are called amortized loans. Each periodic payment consists of an altering proportion of interest and principal where the interest payment is decreasing and the principal payment increasing over the payment term. The decreasing trend in the portion of interest corresponds to the reduction in the unpaid balance (opening balance) of the loan. The loan payment schedules (or amortization schedule) represents a detailed table of the periodic loan payments, displaying the amount of principal and the amount of interest that constitutes each payment until the loan is paid off at the end of its term. The best way to have a better insight into this subject is to take a practical example. The below table represents a loan payment schedule for a 500,000 dollars 20-years mortgage loan repaid yearly with an annual rate of 5 per cent. The yearly loan payment in this case equal to 40,121.29 dollars. Hopefully noticing the trends in this table helps you understand what amortization is! The opening balance each year represents the unpaid balance (the amount of loan to be paid). 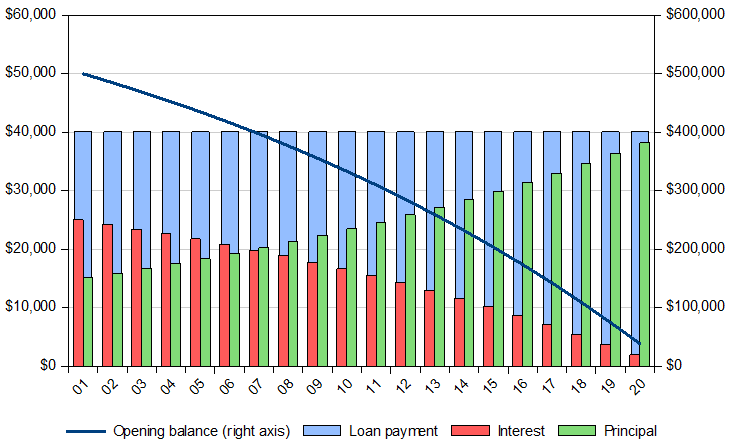 As the interest payments are relatively high at the beginning of the loan term, the part of the principal is small during the early periods; thus the unpaid balance decreases at a slow pace. However, as the opening balances decline, the interest payments gradually lessen as well, resulting in a growing portion of principal repayments. The larger principals, in turn, increases the rate of reduction in each period's opening balance. Loan Payment Calculator can be embedded on your website to enrich the content you wrote and make it easier for your visitors to understand your message.